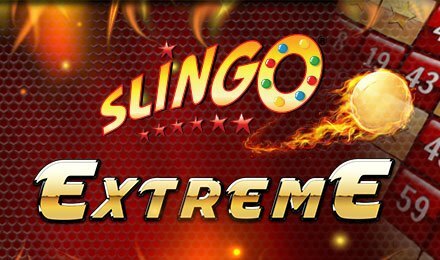 Slingo Extreme is a combination of regular 75-ball bingo and traditional slots that offers faster gameplay, mega cash prizes and extra spins than most other Slingo games. This solo game can be played with real money, with the minimum bet at 50p and the maximum bet at £100. You can actually win up to £50,000 pounds with the full house jackpot. The game is so popular today that you can either use your Slingo login to access the original Slingo site or you can access the game on any one of the online casinos. Layout of the Game The game screen has a rich shaded red background. The game itself is a 5x5 bingo grid of 25 random numbers between 1 and 75. Below that grid is the single slot reel. One the left of the game is the pay table that tells you how much you stand to win, and on the right is the number of spins you have, including free spins. Winning at Slingo Extreme To win at this game, you need to cross off lines of numbers in rows, columns or diagonals. The jackpot is the full house, where you cross out all the numbers on the bingo grid. You can win up to 10 lines in this game, which means that you can wins some really substantial amounts of money. Playing the Game Gameplay is fairly straightforward. - Lay your bet first. The minimum bet allowed is 50p and you can go as high as £10. However, remember, you can’t change the bet once the spins start. - Click on SPIN to start the game. - When the reel stops, you get a series of numbers. You need to cross off those numbers from the grid above the reel. Once you have completed a full line, be it horizontally, vertically or even diagonally, you will get a Slingo win. The more lines you complete with your 11 spins, the more you stand to win. - If you have not been able to finish the game (by winning at least 1 line), or your want to try for the jackpot, you can buy up to 8 more spins. Joker:You can mark off any number in the column above where the joker lands on the reel. Do so strategically, so that you increase your chance of winning the game. Super Joker: When you get a Super Joker, you can mark off any number on the bingo grid. Free Spin:When you get a free spin symbol on the reel, it is saved up for use till after you exhaust your original spins. The Devil: The wily Devil will try his best to block potential number matches on the bingo grid. Free Spins-This game is extremely generous with its free spins. You can win up to 8 extra spins. 3 or More Joker/Super Joker Combinations- If you manage to land three or more Jokers or Super Jokers or a combination of the two, you get an instant cash prize – besides being able to mark off even more numbers off the grid. Live on the wild side and play Slingo Extreme for extreme wins!